« Flying Creatures in Texas? Australia is known for its megafauna, most of which died out long ago. Or did they really? The following is an article called Giant Lizards of Australasia, the megalania prisca from The Strangerest. No ownership is claimed over any of this material, it is being posted purely for educational purposes. The animals usually associated with the Australian continent are koalas, kangaroos, wombats, and crocodiles. There used to be other animals, commonly referred to as megafauna, that roamed this continent before being wiped out by plague or man. These were nightmarish versions of the creatures that exist in Australia today, 10-foot tall kangaroos that fed on flesh rather than vegetation, and at least as recently as 3000 years ago, giant lizards that dwarfed the Komodo dragon. 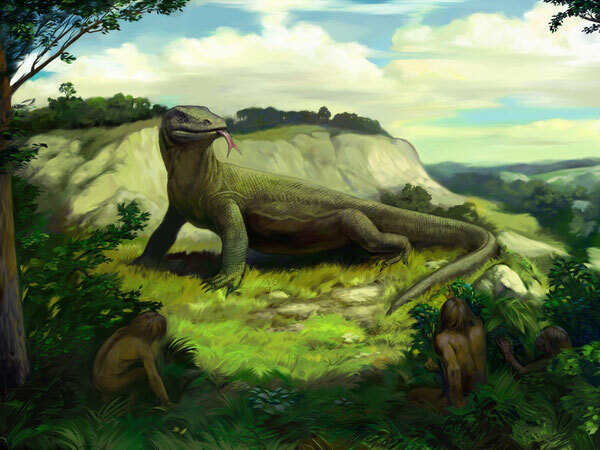 These lizards were megalania prisca, a reptile reaching 30 feet in length and weighing at least 1,000 pounds or more. The Komodo dragon is roughly the size of a lion, but megalania was bigger than an average dairy cow. 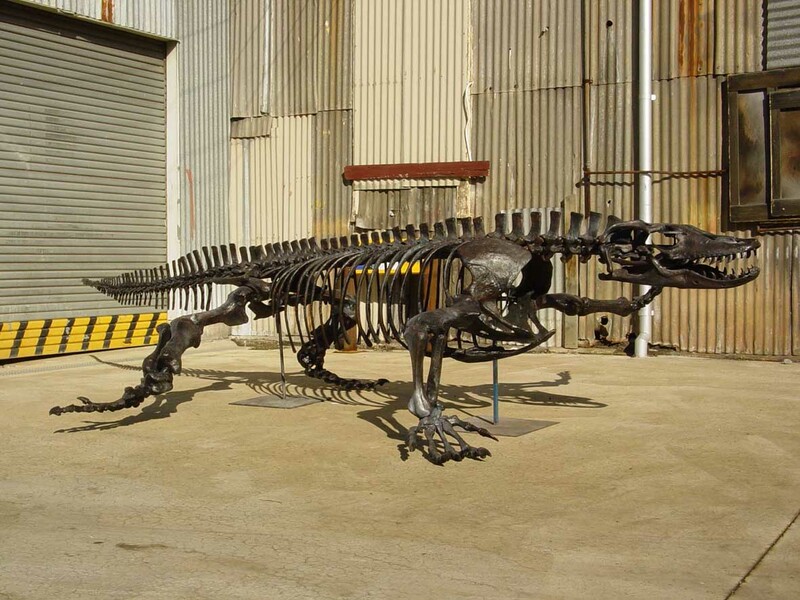 Extinct megalania is listed with the many casualties of the Ice Age. Or is it extinct? Creatures matching it’s description has been sighted many times in the last century, and some sightings suggest that it lives also in New Guinea. As recently as the late ’70s there have been megalania sightings. In July 1979, Rex Gilroy was informed of footprints of the creature found in a recently plowed field. Across the field were 30 or so tracks from what looked like an enormous lizard. Rain had ruined most of the tracks but Gilroy was able to make a plaster cast of one that had been preserved. The footprint looked surprisingly like something that might have been made by a Megalania. Also in 1979 a sighting of megalania arose, this time by the best possible witness. Herpetologist Frank Gordon, after conducting some field work in the Watagan Mountains in New South Wales, returned to his vehicle. After starting his engine he saw, what he at first thought was a log, scampering off. It ended up being a lizard of some 30 feet or more in length. Another incident includes a farmer who observed a gigantic lizard walking along one of his fields. It walked alongside a wire fence, so the farmer used a set of fence posts as a guide. His estimate of the beast was a length of twenty to twenty-five feet. 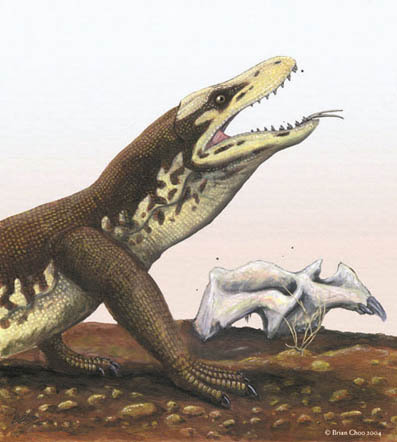 Megalania might not be constrained only to Australia–some sightings suggest it may live in New Guinea. A French priest in the 1960’s was traveling up river with a native guide in order to reach his mission. During the trip he spotted a large lizard lying on a fallen tree in the sun. He told the native to stop, but being badly frightened, the native continued the journey. The priest returned to the spot the following morning and measured the tree. It was 40 feet long, yet the lizard almost matched it. The wilds of the New Zealand islands may also have a monstrous secret lurking within them. There are 90 species of lizards currently known in New Zealand. Most are not of any impressionable size and yet from Captain James Cooks’ first arrival in New Zealand, strange tales of large lizards have been passed down to fairly recent times. One of these lizards, the Kumi lizard, was apparently of impressive size. According to Aboriginal tradition, a ‘horny-skinned goanna bunyip” is said to have existed in New South Wales and elsewhere across Australia under a variety of different names in the long-ago Dreamtime. It was described as being of enormous size and smelling “terrible”. Their rock engravings and cave paintings across the continent clearly depict these and other reptilian monsters, but more on that matter later. Aboriginal rock engravings depicting Megalania near Sydney and the central coast of New South Wales date as recently as 3,000 years-the age of some fossil fragments of the creatures found in various parts of eastern Australia, if not elsewhere. We now turn to the north coastal and inland districts of New South Wales where Aboriginal people from most ancient times were well-acquainted with the giant monitors which they called “Mungoon Galli”. However, they appear to have confused these up-to-30-foot-long reptiles with another, larger beast, which they claimed to have reached the astounding length of 50 feet! That such a monstrous form could still survive out there in those wilds seems preposterous, but there are Aborigines who claim they do! Even if extinct today, perhaps long ago in ice-age times, and earlier, such a species existed. And, if so, perhaps its fossil remains may yet turn up. These monsters were monitors in every detail. Aborigines say their legs were as much as six to seven feet tall when standing and in the walking position. They had a massive head at least four feet in length and a long thick neck, much like a monitor’s, which reached a length of around 10 feet. The body reached about 20 feet in length, matched by a long thick tail of the same length. “These monster-goannas once roamed the whole continent far back in the Dreamtime. Our people used to hunt these monsters in big parties, but hunters had to be careful; for if you were caught, these big fellas would pick you up in their mouths and eat you,” said one old Taree Aborigine to a researcher back in the early 1950s. Like their smaller 30-foot counterparts, they were said to overturn trees of reasonable size. Even today, when a large tree is heard to fall in the forest depths by day or night, Aborigines will say it is the work of a “Mungoon Galli”. Over the years some people have claimed to have found massive footprints of these creatures, but if so, no photographs or casts have been forthcoming. But there are genuine traditions of the monsters among the Aborigines, and until the terrain in which they are said to live can be explored properly, let us at least keep an open mind on the matter. Aborigines say that strange noises heard near waterholes and certain forest areas near Taree and back of Kempsey are the sounds made by giant monitors, and they will not go anywhere near these places for fear of being caught and eaten by one of these reptiles. There is a story from the Cessnock district about an incident said to have taken place in late December 1978. In a far paddock on his property, a farmer spotted a gigantic goanna-looking reptile ripping up a cow with its massive jaws and teeth. The farmer (who did not wish his name to be known) was in a Jeep at the time. He raced off for the house and phoned up mates who, within the hour, descended on the property with their cattle dogs in pick-ups and Land-Rovers, armed with rifles. The location borders swamplands on the edge of thick-forested valleys and mountain country, and it was from there that the monster had obviously emerged. By the time the search party arrived, all they could find was the half eaten cow, much blood, and many large indistinct tracks in the grassy ground. However, other squashed-about tracks and the marks of a massive tail could be seen on the swamp edge leading into the water. The dogs, as well as the men, refused to go any further. Using nearby fence-posts to line up the creature at the time of his sighting, the farmer estimated that it was a good 35 feet (10.6metres) in length, and nine feet or so tall on all fours, counting the great body of the creature. However, few people believed him. Some argued that he must have butchered the cow himself and manufactured the tracks. If this was so, he certainly did a good job. But there are some strange things happening out in those mountains, and I for one am not laughing. Over the years, inhabitants of the Cessnock district have often talked about enormous 30-foot reptiles that they maintain inhabit the dense forests that cover the full extent of the nearby rugged Watagan mountain range. And these monstrous beasts have been known to stray from their mountain homes onto properties on Cessnock’s outskirts. During the last week of December 1975, a Cessnock farmer, tending cattle on his property, caught sight of one of these reptiles moving in scrub nearby his barn. He said it was at least 30 feet in length, was of a mottled greyish colour and stood up to three feet off the ground on four powerfully built legs. During the previous year of 1974, at least 10 detailed accounts of giant lizard activity reached reporters in Newcastle. Mr Mike Blake does not think Megalania is extinct. During 1974 he was sitting on his farmhouse verandah one day with his utility van parked right in front of his house, situated near bushland outside Cessnock. Suddenly, from around the side of the farmhouse, one of these monstrous beasts walked around in front of his verandah between him and his parked utility. Mike remained terrified and “glued to his chair”, as he said later, while the enormous beast turned and looked at him before moving on leisurely across a nearby paddock toward scrub. Mike compared the lizard’s length to his utility which was 18 feet in length. The lizard was at least 20 feet long and stood three feet from the ground. For as long as residents of the Watagan Mountains have known of these giant lizards, so too have the inhabitants of the Port Macquarie-Wauchope district much further up the coast. Attacks upon cattle by giant goanna monsters are part of local folklore going back into last century.